As chief of the Associated Press’ Tokyo bureau, Joseph Coleman wrote a story about an agricultural cooperative in southwestern Japan where organizers put aging residents to work selling leaves and flowers as seasonal garnishes for high-class restaurants. 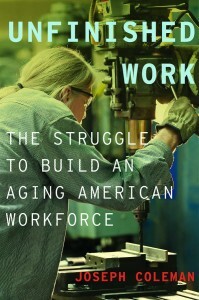 The result is “Unfinished Work: The Struggle to Build an Aging American Workforce,” published by Oxford University Press. Coleman began writing stories on Japan’s rapidly aging society during his years in Tokyo, from 2004 to 2008. “In Japan, life expectancy is among the highest, and fertility rates are among the lowest in the world,” he said. But he discovered the trend wasn’t unique to Japan. In fact, it is just one of the consequences of economic development in capitalist economies. “This is something the many countries will face sooner or later,” he said. “I was looking for companies that for one reason or another found it advantageous and profitable to hold on to or attract older workers,” Coleman said. Coleman said that while his book contains a lot of academic and economic information, that isn’t his main focus. “What I was most concerned with in this book is bringing to life the stories of individuals grappling with this issue. Those individuals include workers, employers, policy-makers and researchers,” Coleman said. Of the myriad reasons people work longer, finances usually are part of the equation. In the United States, Coleman said the private pension system is eroding, so people have less guaranteed money at retirement. At the same time, unemployment can hit workers in their 50s, just as they are juggling mortgages, car loans and their children’s college bills, forcing them to burn through their savings. People need to be saving more, and, according to Coleman, they’re not doing it. “People underestimate how much they’ll need, and how long they’re going to live,” Coleman said. Jamie Burns doesn’t need to work. At 57, the lifelong Scripps Health employee doesn’t need to stand in front of dozens of colleagues at a hospital in La Jolla, California, and guide them through a “Learning Management System.” After all, compared to unemployed older workers, Burns is lucky. Her husband is retired on a public school teacher’s pension. They lived within their means, and now they have savings for retirement. Indeed, if this were the 1980s, when many American companies were intent on flushing 50-something workers out of the system to save money and make room for younger hires, Burns would be a prime candidate for early retirement. So why is she still on the job? Scripps made her an offer she couldn’t refuse: staged retirement. The program is one of several at Scripps that make it a leader among employers who are trying to make it easier, more comfortable and more profitable for America’s expanding aging workforce to stay on the job. The silver labor force is already at work across the spectrum of the American economy. Older workers process our insurance claims, run machines in our factories, pour our coffee. They program our computers, command our armies, and design our policies. They greet shoppers on the way in at Walmart and Lowe’s, and ring up their bills on the way out. The decision to hold onto older workers is a matter of survival. 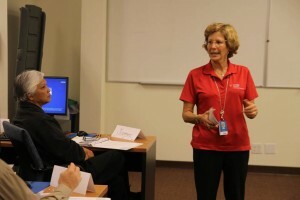 Boomers educated and trained as the United States became the world’s pre-eminent industrial, financial and technological power hold knowledge and skills that keep whole sectors of the economy running. En-masse retirement of highly trained older workers could leave these companies critically wounded in the battle to compete. Many of these companies have innovative personnel management systems. Instead of rigid, one-size-fits-all personnel hierarchies, they toy with job descriptions, scheduling and workflow to account for individual workers’ needs, capabilities and preferences. They even play with the process of retirement itself. Once upon a time, you were either retired or employed. Now companies now see they can hold onto valuable older workers by allowing them to downshift to part-time work, keeping them on the job while giving them time to care for an elderly parent, pursue hobbies or just catch up on time with a spouse. In 2011, her husband Chris retired after more than three decades as a public school teacher, and Jaime started looking at her options. Staged retirement was one of them. She had enough time with the company to qualify, and she could cut down her hours, but keep her full-time employee benefits. So in 2012 she began working three days. She says the program has allowed her to mix work and family more evenly. She spends Tuesday, Wednesday and Thursday at Scripps as a teacher and leadership trainer. Starting on Friday, she and her husband – she plays the hammered dulcimer, he plays guitar and keyboards – bill themselves as “Many-Strings,’’ playing Celtic, Americana and light classical around town. She says the more free time she and Chris have, the more ways they find to use it. Reprinted from Unfinished Work: The Struggle to Build an Aging American Workforce by Joseph Coleman, with permission from Oxford University Press, USA, ©Joseph Coleman, 2015.